Organizing a nurse grad party for your young professional? Surprise him/ her with a stunning graduation celebration. Decorate your event with this unique and an absolute fun thrilled eye-catching party complements which will impress your guests. Wanting to organize a dazzling theme party for your favorite Nursing Graduate? Are you thinking to have a more fun decorations for a graduation that would best match the course they've just completed? These 18 pcs. 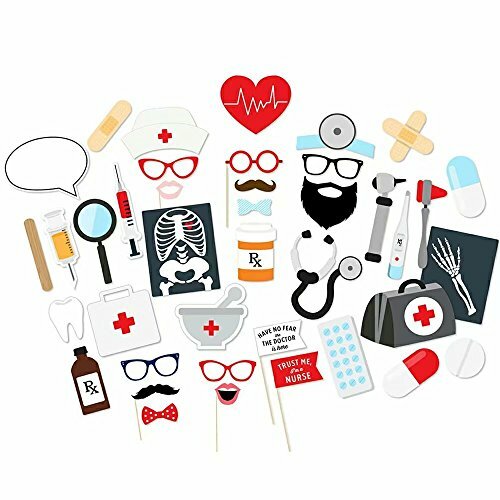 NURSE GRADUATION PHOTO BOOTH PROPS is just the perfect choice for your need. It will definitely fill your graduation celebration with an absolute flair. Each set contains 40 DIY props. Have more fun assembling them with friends and family! Perfect party supplies for a "doctor/nurse" themed party. This DIY Nurse Graduation photo booth props is also a great addition to a Nurse Theme Baby Shower, Weddings, 1st Birthday of your daughter, or a Photo booth frame for a Nursing Theme Party. Decorate your event with this unique and an absolute fun thrilled eye-catching party complements which will impress your guests. If you have any questions about this product by iMagitek, contact us by completing and submitting the form below. If you are looking for a specif part number, please include it with your message.